It pays to use a specialist PSV insurance company. In this tough economic climate, fixed cost management is vital – and so is having more than adequate levels of cover for your company, employees and passengers. We offer attractive solutions for bus, coach and mini-bus operators. This applies to owner-drivers through to nationwide fleets. Our bus and coach insurance cover can be bus only policies, coach only policies or for larger operators a policy with a combination of both vehicles. We specialise in fleet insurance policies for PCV operators. 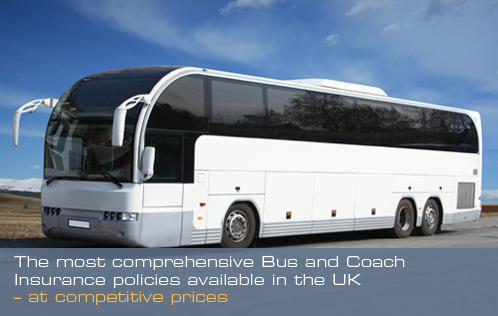 We offer competitive insurance rates and expert knowledge for the whole spectrum of buses, coaches and mini-buses. This includes private hire, public hire, contract work, charities, stage carriage and overseas travel. We have a wide panel of bus and coach insurance providers – and we will shop the market on your behalf to make sure you have the best cover at the most competitive prices in the UK. As bus and coach specialists, you’ll be sure to speak to an advisor who understands your business and the market in which you operate. Click here for bus and coach insurance reviews, to see what some of our busandcoachinsurance.net customers said about us! Do you want an insurance policy with no excess to pay? Then our new Excess Protection policy for Buses, Coaches and Mini Buses could be perfect for you. We now have access to another new product aimed at PSV Operators. The product protects you from having to pay your policy excess, typically £250 but sometimes as high as £1000, in the event of either a fault or a non-fault accident if you have Comprehensive cover. Interested in obtaining a quotation? Windscreen and Glass Cover for buses/coaches. If your bus/coach insurance policy provides Comprehensive cover then you will undoubtedly have windscreen cover in force. This means that if the windscreen or a window or the glass sunroof of your vehicles is broken or damaged then your insurer will pay the reasonable cost of repairing or replacing it. However, any claims made will be subject to a policy excess, perhaps £250, and they will affect your no claims discount if you are not on a fleet policy. One way to avoid this happening, and then seeing a subsequent rise in your premium at renewal, is to take out a standalone glass policy. These are generally available at a cost of 10% of the cover required plus the government’s Insurance Premium Tax (IPT). For example, £1500 of glass cover would cost around £150 plus IPT, which comes to £159. Any claim made under this glass policy would not affect your no claims discount and you would have no excess to pay.